BuySellAds has just released a new extension for Google Chrome (with a Firefox version on the way) that is aimed at advertisers. It displays a BuySellAds icon in your toolbar, which lights up red when a website you visit has BuySellAds zones available. Clicking it displays a popover dialog that shows the publisher’s zones and lets you buy them out. I think it’s a neat idea. It makes it easier for advertisers to find and buy ad space, which could potentially result in smaller publishers having their ad space filled. BuySellAds, the ad marketplace popular among internet and computer blogs, recently released a Cocoa framework for displaying ad zones in OS X applications. In a not unexpected, but certainly intriguing, turn of events, they have now released a version of the framework for iOS. Yes, that means BuySellAds is coming to the iPhone and iPad. Think about that for a minute. There are now three major ad networks available for app developers to use in their products. Apple’s own iAd, with it’s fun and user-friendly interactive mini applications; Google’s AdMob banners; and now BuySellAds. The big difference between BuySellAds and the other two is that you get final approval before an ad is displayed in your application. Also, the advertisers pay a fixed amount to run their banner for a specific stretch of time, while Apple’s and Google’s offerings cycle different banners in using an automated targeting algorithm. Choice is good, and some developers will definitely benefit from having BuySellAds as an option. Instead of having a bunch of banner ads, wouldn’t it be better to have just one high quality one in a prominent place? That’s the premise of networks like Fusion Ads and The Deck. Now BuySellAds, the large ad marketplace that I use here on Webmaster-Source, is launching a side network that works in the same way. AdPacks is an exclusive invitation-only ad network split into three topical categories. Publishers display a single ad zone that randomly cycles through the network’s banners. Advertisers pay $399-$599 to advertise network-wide and each site in the network gets a cut of the money. The basic idea is “less is more.” Instead of bombarding users with advertisers, the advertisers pay more to be the center of attention. If their product is the only one being advertisers, there’s less to distract from the one ad. I would love to get in on this, but I’m probably not cool enough. It seems like AdPacks would pay better as well as creating less on-screen clutter. This has been in the works for awhile, but Mac AppStorm is reporting that BuySellAds is finally putting ads in OS X applications. If you have a Cocoa application, you can use an API to inject ad zones into your application. 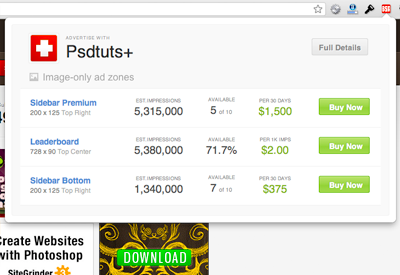 The ad zones appear in the BuySellAds marketplace just like any website, but the ads will be pulled-into your program. Bodega and the Kiwi Twitter client are both using the ads. This is something that I have been wanting to see for some time. We have already seen a few free internet-connected applications, such as Evernote and Tweetie for Mac, supported by Fusion Ads and The Deck. It’s cool to have BuySellAds, a less exclusive network, offer a similar option to developers. 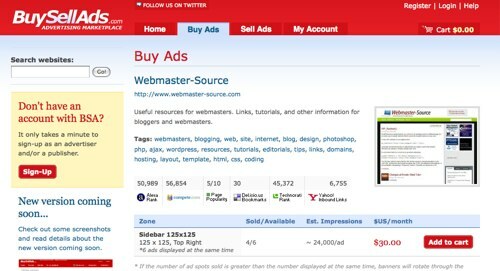 BuySellAds, the ad network that I use on Webmaster-Source, has introduced a cutting-edge ad-serving feature. Their new asynchronous ad serving script dramatically speeds up page loading times, as the browser doesn’t have to wait around for the ads to load. Todd Garland, the founder of BuySellAds, hopes that other networks will follow suit with their own asynchronous solutions, resulting in a faster internet. If the major ad networks like Google AdSense, Yahoo! Network, AOL Advertising, as well as the popular ad serving products such as Google AdManager and OpenX converted their ad code to be non-blocking, the internet as a whole would become an order of magnitude faster. I genuinely hope that the larger ad networks will step up to the plate and follow our lead on this. A faster internet is a happier internet. This is a big deal. I’m already using the new ad code here, as are many of the sites in the BuySellAds marketplace. BuySellAds has announced two new ad programs that are currently in beta stage: “premium” banners and Pay-Per-Click text ads. As you know, we have traditionally sold display ads at fixed 30-day rates. It is important to note that we are not abandoning the sponsorship model at all, it is still our core business. However, there has been a growing need for both advertisers and publishers to have more options. Premium and Pay Per Click are the first additional options we are releasing in a series of innovative developments that we have to come. The Pay-Per-Click ads are a type of ad zone that resembles an AdSense block vaguely, with the most noticeable difference being that the ads have icons next to them. “Premium” banners are network ads. An advertiser can pay a minimum of $2,500 to have their banner syndicated across any sites in the BSA network that run the banners. Payouts were not discussed in the post, as the new ad zone types are still in beta. Both of the new ad types have one major advantage though: you don’t have to worry about advertisers booking ad spots on your site, as they’re network-wide. As a user of BuySellAds, I will be watching this with great interest. Turn Off Caching in the BuySellAds WordPress Plugin! This is because Buy Sell Ads network is now also tracking the number of times the ads themselves get requested (not just the tracking pixel). If the ads are cached on your server, then they are not going to count in your Buy Sell Ads statistics whenever it is being displayed (lowering your impression count). The caching mechanism is being taken out currently, but in the meantime you should simply disable it. I’ve previously talked about the distinguished BuySellAds banner marketplace. The network makes it much easier to sell ad space on your website, and has proven to be an excellent alternative to directly making deals with advertisers. 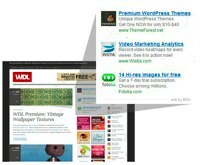 The Buy Sell Ads WordPress Plugin, once installed, allows you to insert an ad zone into your sidebar simply by dropping a widget in. For ads elsewhere, or if you don’t have a widgetized theme, you can use a template tag instead.